Octavia the Octopus grew up the seventh of 19 siblings in a large tank in the Tokyo Aquarium. She always had an affinity for cooking and eating, which probably developed after watching her mother devour several of her sisters in a delicious hollandaise sauce. 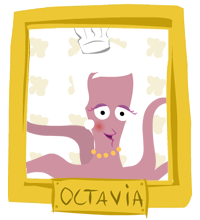 Since then, Octavia has been a professional chef in several major restaurants, notably ‘Atlantis’ and ‘Neptune Junction’. Octavia met Rich Morning on the set of his show and the chemistry was instantaneous. Rumors of a possible romantic relationship between the two are the talk of Hollywood. Octavia loves long swims in the jacuzzi and drinks her own ink when she gets nervous.